03/19/1991 - Enforcement of the Hazard Communication Standard as it relates to "vegetable oil mist"
Title: 03/19/1991 - Enforcement of the Hazard Communication Standard as it relates to "vegetable oil mist"
Thank you for your letter of December 19, 1990, regarding our meeting of the previous day during which we discussed the Occupational Safety and Health Administration's (OSHA) enforcement of the Hazard Communication Standard (HCS), 29 CFR 1910.1200 as it relates to "vegetable oil mist." As discussed in your letter and its attachments, in OSHA's recently revised compliance directive, OSHA Instruction CPL 2-2.38C, "Inspection Procedures for the Hazard Communication Standard," the agency issued new enforcement policies with regard to hazard communication requirements for substances formerly designated as "nuisance dusts." CPL 2-2.38C states that any substance with a specific OSHA Permissible Exposure Limit, (PEL), regardless of the health effects, is covered by the HCS. As discussed in our meeting of December 18, the new language in the compliance directive was added to ensure consistency with the requirement of the HCS that any substance with an OSHA PEL be considered one of a "floor" of hazardous chemicals covered under the HCS. All chemicals with a specific OSHA PEL or a specific ACGIH Threshold Limit Value (TLV) are automatically covered by the HCS and an MSDS and label must be developed and transmitted downstream by the chemical manufacturer or importer. "Vegetable oil mist" was assigned specific OSHA PELs in the revision to the Air Contaminants Standard (29 CFR 1910.1000, Subpart Z, January 19, 1989). The previous compliance directive for the HCS, CPL 2-2.38B, had provided specific guidance for situations where a chemical manufacturer or importer did not produce a label or MSDS for any substance listed in Appendix D of the 1987-88 ACGIH TLVs as an example of a "nuisance dust" and for which a valid hazard determination showed that the substance presented no potential hazard to exposed employees "other than being a nuisance." In these situations, a violation of the HCS would have been considered by OSHA to bear no direct or immediate relationship to safety and health. In those instances, any violation for the lack of an MSDS or label for these substances would have been classified as "de minimis." Your letter states that OSHA's new policy does not allow the "de minimis" consideration but does require an MSDS and a label for substances such as vegetable oil mist which, under the old policy, would have been considered on the basis of the existing ACGIH TLVs and their physical irritant effects only. The new policy does not address the "de minimis" classification for lack of MSDSs and labels for vegetable oil mist and other substances that have been assigned specific OSHA PELs even though the evidence suggests that they do not present a physical or health hazard other than physical irritation. In the 1989 Air Contaminants final rule, OSHA included a new category for compounds formerly designated as "nuisance dusts." This new category is entitled "Particulates Not Otherwise Regulated" (PNOR) and sets PELs for compounds in this category at 15 mg/m3 total dust, 5 mg/m3, respirable. According to your letter, OSHA's policy to require MSDSs and labels for substances with specific PELs but which otherwise are no different from PNORs as to their health effects and even have the same numerical PEL values is "inconsistent and without justification." After carefully reviewing this issue, we agree that, while this policy is consistent with the Hazard Communication Standard's requirement that any substance with a specific OSHA PEL is automatically covered by the HCS as one of the "floor" of hazardous chemicals, your argument is persuasive. Thus, even though employers and employees should expect that a substance with a specific OSHA PEL would require a MSDS and label to be transmitted downstream, in consideration of the evidence discussed, if a chemical manufacturer's hazard determination produces evidence that the substance poses no hazard (including potential hazard) to exposed employees other than being a physical irritant, then the Agency will consider the lack of an MSDS and/or a label to have no direct or immediate relationship to safety and health. As such, any violation for these deficiencies would be classified as "de minimis." ILPI Editorial Note: OSHA has a cotton dust standard, 29 CFR 1910.1043. See the OSHA Cotton Dust Information Page for further information and resources. This is consistent with OSHA's previous policy which sets forth the same citation guidance. Again, since the health effects data and the PELs are identical to those of PNORs, OSHA will change its enforcement guidance currently given in CPL 2-2.38C, page A-11, to be similar to guidance given in the previous Instruction, CPL 2-2.38B. We will communicate this change to our field staff initially by memorandum, then follow by the issuance of a change to the directive. A copy of our memo to our Regional Administrators is enclosed for your information. We would like to stress, however, that this change is a change in violation classification only. Chemical manufacturers or importers of the types of "nuisance dust" compounds discussed herein are still required under the standard to develop and transmit MSDSs and labels for these substances with specific OSHA PELs. This change in enforcement policy merely states that where a properly-conducted manufacturer's hazard determination shows physical irritation to be the only health effect, the lack of a label or MSDS for these substances with PELs and health effects data identical to other PNORs will be considered a "de minimis" violation. 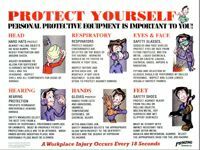 Pretect your workers with supplied air respirator systems like this one from Safety Emporium.